Best materials. 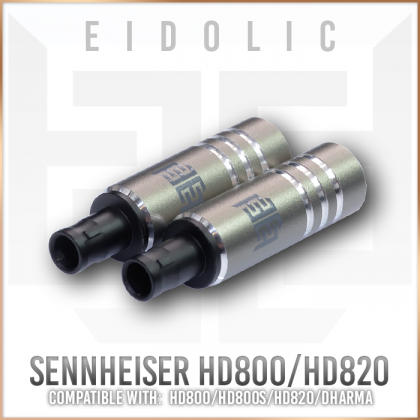 The Eidolic HD800 connector features a durable anodized aluminum barrel with PEEK insulation - the highest temperature, most durable insulator - and large gold-plated brass solder contacts. The contact piece’s shell is also CNC machined aluminum, not die cast metal, so its fit is snug without catching in the jack. Ease of use. No HD800 connector has ever been this easy to use. Instead of a tiny, flimsy contact piece with two metal rails to slide it into the barrel, the contact tip, insulator, and pins are integrated together with a cable clamp and a screw-on barrel. The solder contacts are considerably more ample than previous HD800 connectors, which were infamously hard to work with. With a large 6.2mm rear opening, practically any headphone cable is compatible. Legendary style. Gunmetal bead blasted aluminum with bright chamfers and three engraved bright rings set this connector apart, finished with a gray Eidolic logo. The contact tip is silver aluminum to add to the silver & gray contrasting color scheme. Fits HD800, HD800S, Enigmacoustics Dharma, and any other headphone with this jack type.